He went dancing with a girl once. Or, rather, he’d gone dancing a lot, with many different girls, but he’d only gone dancing with this one girl one time. She wore glasses whenever he saw her, but she didn’t wear them while she danced. That day, they had been working together in the office, when she extended the invitation, so he went. The music that night was indescribable, in the sense that he couldn’t remember it. The dance floor was packed, so they had to dance close. Now, he can’t even remember her name, but he can still remember her warm breath on his neck, his hands around her waist. What was her name? Why has this one random night appeared in his memory? Did he ever see her again? Why can’t a beautiful memory of his wife get triggered instead – something that would reaffirm his life choices rather than calling them into question. Whenever he dug deep into his memory, looking for something sweet, when they were young and dopey in love, he could only come up with the summer they went camping and took their 1-year-old daughter along. His daughter was too young to do anything but stare up at the Redwood trees with mouth hanging open. She cried when smoke from the campfire got in her eyes, or dirt got in her hair or the river flowed. Maybe it wasn’t the river, maybe it was something else, but the water seemed to really bother her. He tried to cover her eyes whenever he and the wife were on a hike, handing her a cheerio to distract her and directing her eyes towards the treetops again. That same summer was the first time he saw them. They had just finished eating a camping dish that his wife called “hobo packs” even though that terminology was less than politically correct – they were made up of hamburger meat and vegetables and Campbell’s Mushroom Soup wrapped in foil and thrown on the fire. The wife had taken their daughter to get ready for bed at the public showers, and he sat back to smoke his pipe, which was an affectation he had just picked up. Night fell. The redwood trees were plentiful and thick in this campground, the only place you could look up without seeing a canopy of old growth behemoths was when you were near the river. He puffed ineffectively on his pipe and had his feet up on a folding side table when the propane lantern went out. The forest was deathly quiet – each camp site was advertised to be at least 200 yards away from anybody, and the trees muffled the rest of the noise. The glow from the embers of the spent camping fire was peaceful, and he didn’t get back up to see what was wrong with the propane tank. Instead, he felt a tug, from the middle of his chest. Like a puppy nipping at his shirt, and then like a rope tied around his middle. He got up and rubbed the spot with his palm. It didn’t hurt – he re-lit his pipe and then walked in the direction he was tugged. He stepped with sure feet into the darkness and didn’t look back. A massive redwood stump sat in a clearing, its trunk felled but still there, a few feet away. The clearing was lit by a fantastic light – bright and welcoming, a fluorescent miasma that didn’t hurt when he stared. The tug in his chest felt lighter, and he stopped and watched the colors move against one another, until they came apart, into separate beings. He couldn’t come closer. His feet wouldn’t take him. 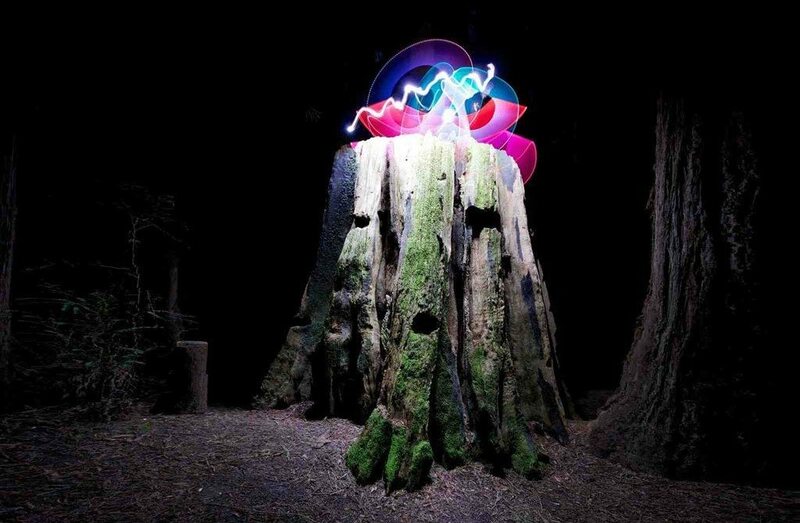 But the colors swirled upwards, forming a neon and firework tree trunk, impossibly beautiful and ephemeral. They burned away almost as quickly as they appeared. He was only left with the memory of the brilliance of the tree. He wandered back to camp, then. Exhausted. He spent the week in the tent, barely able to move, unable to sleep, his mind cycling through every girl he’d ever loved, even briefly. There was that other girl. The one he asked to marry him, the one that said no and went to someone else. He thought about her, suddenly. He hadn’t seen her in almost 30 years. Sometimes he’d think of the characters of his life, arranged like the cut-outs on the Sgt. Pepper’s Lonely Hearts Club Band cover, only hundreds of people, thousands. The supermarket clerks he’d flirted with, the members of his high school theater company, the kid who showed him the dirt bike path with the jump. He’d whistle a strange tune, stuck in his head for months, as he got lost in his own muddle, overriding every recollection with these memories of girls and dreams. Sometimes he’d be back in the woods, but with his sophomore sweetheart, the one who moved to San Francisco and stopped answering his letters. He should have followed her, professed his love. Did his wife look back at the decision tree of life and wonder about Frost’s damned path not taken? Did his daughter? How old was she? Where was she last? When he caught pastel colors in the corner of his eye, he’d whip his head in a double take, just in case there was a will o’ the wisp to chase, another light that could give him answers to his questions. His headspace felt airy and full of holes, and he’d try to stop trying to remember. Instead, he’d fill his thoughts with one question. What was to become of him now? Posted on Sunday May 5th, 2013 Thursday April 2nd, 2015 by Max Elman. This entry was posted in Photos & Stories and tagged camping, lights, night, redwoods. Bookmark the permalink.